Dr John Webster is Emeritus Professor in Animal Husbandry at the University of Bristol, UK. Amongst his many achievements, Professor Webster was recently awarded an honorary degree by the Royal Veterinary College for his research in animal science, as well as the Universities Federation for Animal Welfare (UFAW) Medal for Outstanding Contributions to Animal Welfare. He established the Animal Welfare and Behaviour Group at the University of Bristol, one of the largest and most highly-regarded of its kind in the world, and was a founder member of the Farm Animal Welfare Council which pioneered the Five Freedoms for farm animals. Drawing on an international range of expertise, this book reviews research addressing the welfare, nutrition and health of dairy cattle. Part 1 begins by discussing key issues in welfare followed by topics such as genetic selection and welfare, housing and transportation. Part 2 looks at nutrition with chapters on rumen microbiology, feed evaluation and formulation, feed supplements and feed safety. The final part of the book covers aspects of health such as control of diseases and other disorders such as lameness as well as dairy herd health management. 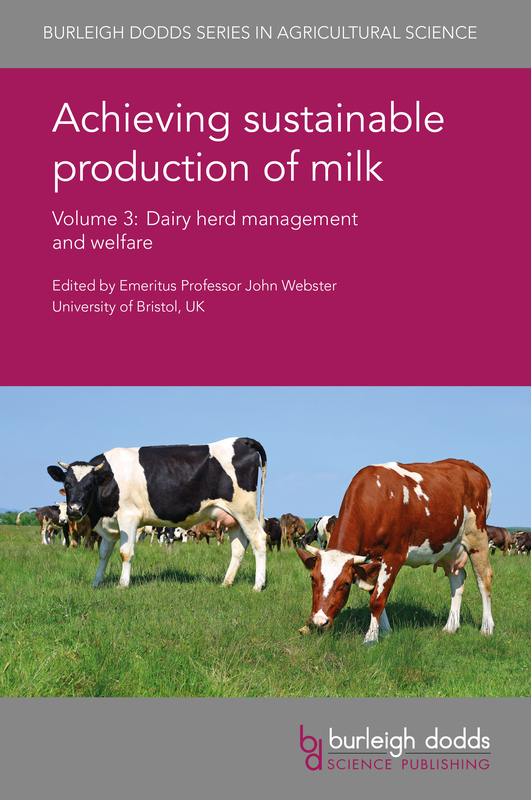 Achieving sustainable production of milk Volume 3: Dairy herd management and welfare will be a standard reference for animal and dairy scientists in universities, government and other research centres and companies involved in beef production. It is accompanied by two other volumes which review milk composition, genetics and breeding as well as safety, quality and sustainability. "There can be few people in the world better qualified to edit a new book about nutrition, health and welfare of dairy cattle than John Webster. These have been the passions of a long and distinguished academic career. He has assembled a strong team of authors to provide comprehensive coverage of key topics, as well as the wide range of dairy production systems across developed and developing countries"
"…the book offers important and in-depth information on dairy cattle welfare, nutrition and health."